After a walk or before bed, it can be good to give our dirty dogs a quick clean; ideally using gentle quality dog wipes. Very handy and inexpensive, antibacterial wipes for dogs are a must-have at home and regardless of the occasion, you will use them at some point. Whether you need to treat your dog's bacterial and fungal skin infections, or you simply want to freshen up your pet in between two baths, antiseptic and cleaning wipes for dogs are very convenient. Get the box, take one sheet out, wipe your pooch, and put the cloth in the bin. Job done! A dog's skin and dog's epidermis are a lot more sensitive to chemicals and irritations than human skin. This is because dog's epidermis is alkaline — dog skin has a pH level around 7 versus a more acidic 5.5 pH level for human skin. Therefore, you should never use any human antibacterial wipe on your pets, it may harm them more than do them good. 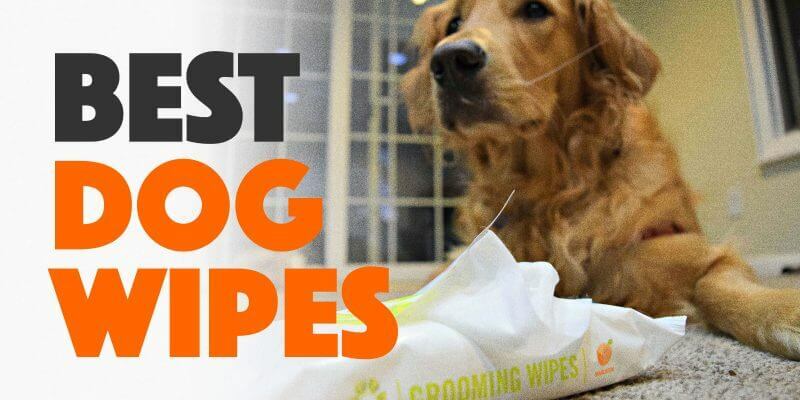 We're listing all the most popular types of cleaning wipes for dogs below so you can see which ones you may need to buy now. If you didn't know, even dental wipes exist to clean up your dog's teeth. 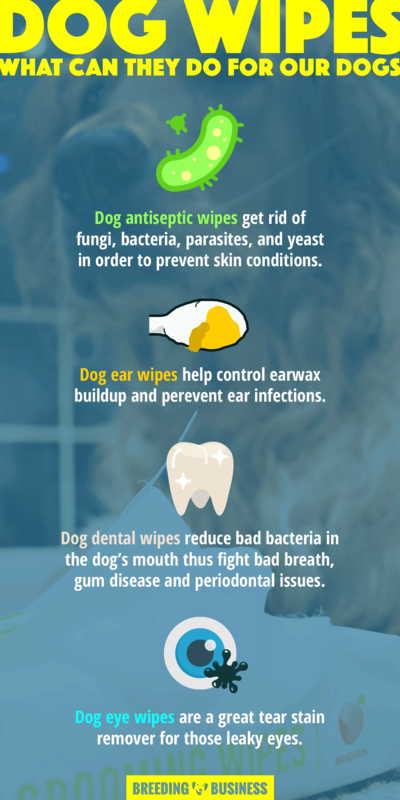 Infographics: benefits and use cases for the best dog wipes. Skin infections can be caused by several microorganisms including yeast, bacteria, fungi, microbes, grease, acne and ringworms. Every single dog obviously carries some of these organisms at all times but its their accumulation for an extended period of time that may cause an irritation or infection of the skin, eye, ears, etc. 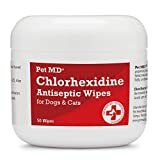 The Pet MD Chlorhexidine Wipes are our favorite antibacterial dog wipes because they are a non-stinging topical treatment for skin infections, ringworm and hot spots. The formula has strong antifungal properties and will kills most types of yeast and bad bacteria found on dog skin. Because a dog's skin is very sensitive, antiseptic wipes for dogs should never contain high doses of harsh ingredients commonly found in human antiseptic solutions. With dog cleaning wipes, antimicrobial properties should come from small doses of strong compounds such as chlorhexidine, ketoconazole in an alcohol-based solution. Too gentle antifungal wipes would simply smell nice but with lack efficiency and strength in getting rid of microbes, bacteria, yeast and parasites. Dog grooming wipes are mainly used by dog owners to give pets a quick clean in between two full bathing sessions. Depending on the size of the dog you will need more or less grooming wipes but your dog will smell better and feel fresher. Be careful since most dog grooming wipes are only here to mask any bad smell coming off your dog's coat or skin — these wipes don't actually fight against the bacteria or parasites causing the bad smell, they just add a layer on top of it. Grooming wipes should definitely be gentler than antibacterial wipes for dogs because they are used more frequently. You may want to also look at the best dog colognes and deodorizing wipes for more grooming products. Dog's mouths require as much care as ours: daily toothbrushing. The problem is that using dog toothpaste isn't always an easy thing to do for most dog owners. Especially with untrained dogs, dental hygiene can be a difficult act: the dog will move, escape and eventually, get super anxious and hide. Dog teeth wipes, also called tooth wipes, are the most convenient replacement to using a toothbrush. Daily wipe your dog's teeth with one of these dental wipes and it will work at controlling tartar building and mouth bacteria causing bad dog breath, gum disease, and tooth discoloration. Our favorite dental wipes are the Petkin Toothwipes that will safely yet effectively clean your dog's teeth and gums. Petkin dog teeth wipes freshen your dog's breath thanks to their strong antibacterial action, reducing tartar and plaque. No water or rinsing is needed but you should use wipe your dog's teeth daily. Lastly, it contains baking soda as a safe whitening agent for a nicer doggy smile! Dog ears are the body parts most dog owners want to avoid cleaning simply because dog ear cleaning is an unpleasant experience for the dog; and requires a lot of handling from the owner during the whole process. We found out that doing a proper ear cleaning at the vet followed by using dog ear wipes regularly helps hugely with keeping your dog's ears clean and fresh. Ear wipes are cheap to buy, priced around the $10-mark for a six-month supply, and will effectively prevent ear infections when used twice a week. 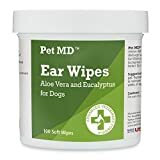 Our favorite pick, Pet MD Dog Ear Cleaner Wipes, has a veterinary-prepared formula that removes debris, reduces wax build up in the ear canal, and dries the dog's ears. Keeping ears dry is extremely important because without moisture, yeast and bacteria will have a very hard time to grow. When buying ear wipes, you have to be 200% sure that the ingredients used don't include harsh compounds—ear skin is even more fragile and sensitive! Make sure the ear cleaning wipes are alcohol-free and non-irritating. Ear wipes shouldn't be used on puppies that are less than four months old. Tears, mucus and saliva are the primary cause of hair stains on dogs; they are hard to get rid of so make sure you clean them up using the best eye wipes for dogs whenever you start seeing them. Because of where these stains are, mainly near the dog's eyes or mouth, it is extremely important to use a reputable well-rated dog eye cleaner. Each pre-soaked eye wipe should only contain natural plant-based ingredients and most definitely avoid alcohol, fragrance, bleach and other synthetic chemicals. Otherwise, you risk burning or irritating your dog's eye and face huge vet bills to just do some damage control. 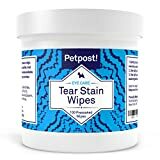 With a natural hypoallergenic tear stain remover such as the Petpost Tear Stain Remover Wipes, you can wipe your dog's tear stains without risking any eye irritation. If your dog breed commonly has leaky eyes, get yourself a box of these hypoallergenic plant-based eye wipes. Once you start cleaning your pet's stained eyes, it may take a few days or weeks to see the original color back, depending on the severity of the stains. Wipes are a dog owner's best friends and they are so cheap that it's easy to always have some of them stashed up at home. Whether your dog needs a quick coat grooming, ear cleaning or skin disinfection, dog wipes will come in handy. About the debate on dog wipes vs baby wipes, the only recommendation is to never use human or baby wipes onto a dog's body, regardless of the body part. There are some very gentle baby wipes out there that would most likely be acceptable for dogs but it simply is not worth taking the risk considering how cheap dog cleaning wipes are.